9ct white gold with diamond earrings. In an intricate twist pattern, these stunning earrings are perfect for very occasion. Intricate 9ct white gold twist earrings. 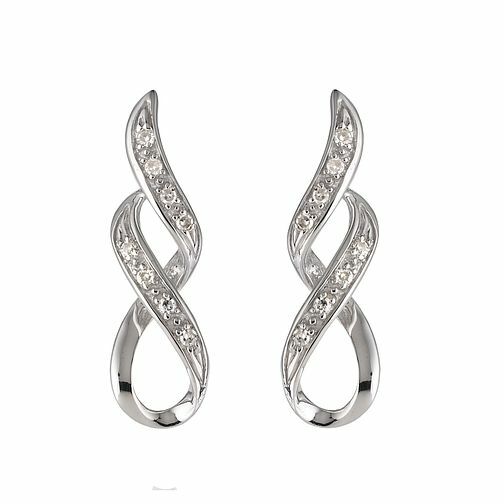 9ct white gold with diamond twist earrings is rated 5.0 out of 5 by 3. Rated 5 out of 5 by Anonymous from Beautiful earrings Delicate but suitable for everyday wear. A bit different and frequently complemented for wearing them. Rated 5 out of 5 by Anonymous from A great gift - mine were for a 50th for my best friend Stunning setting and look lovely when worn - my friend was thrilled with the choice. Great value for money!